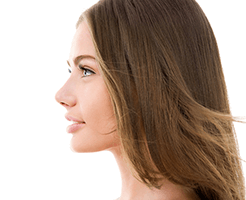 Rhinoplasty or “Nose job” is a Plastic Surgery procedure to reshape the nose. The aim of the surgery is to make the nose more aesthetically pleasing and proportional to the rest of the face. Changes in the appearance of the nose can dramatically improve overall facial appearance and will improve self-esteem in people who are sensitive or self-conscious about the appearance of their nose. In the initial consultation, the patient will describe their concerns about their nose and preferred shape. Dr Safvat will advise and guide the patients to make sure they have realistic expectations and goals. It is not possible to give the patients someone else’s nose (eg Nicole Kidman or Brad Pitt!!). The aim of Rhinoplasty like all Cosmetic Surgery, is to improve the look of the patient by making the results appear natural but proportional and in harmony with the rest of the face. It is tailored for each person individually. The operation for Rhinoplasty takes between two to three hours, and is done under general anaesthetic. In all of Plastic Surgery and more so in Rhinoplasty, pre-operative planning is essential. After detailed assessment of the anatomy of the nose, the quality of the bone, cartilage,skin of the nose, the shape of the face, and patient’s wishes, a plan is drawn as to how to change the nose accordingly. This can be changing the shape of the tip of the nose; narrowing the span of the nostrils, removing a dorsal hump, changing the shape of the bridge or changing the angle between the nose and upper lip. Although the procedure can be done through a closed technique (all incisions on the inside of the nose), Dr Safvat largely uses an open approach where a small incision is made across the skin that bridges the tip of the nose to the upper lip between the nostrils (the Columella). The rest of the incisions are inside the nose and hidden. This allows great access to the cartilage, soft tissue, bones and the septum of the nose, and the ability to change them with more precision and accuracy. Occasionally additional cartilage or bone from other parts of the body (for eg from the ribs or the ears) may be required for the reshaping of the nose. There may also be significant functional impairment to the nose like breathing difficulties. These will need to be addressed at the same time as the aesthetic operation. Rhinoplasty is usually done as “day surgery” but some patients prefer to stay over night. Patients usually need to have 1-2 weeks off work to rest and recover at home. Exertion and heavy lifting are not allowed for 3-4 weeks. It is also important not to blow the nose forcefully in the first 1-2 weeks. There will be a splint on the nose for 1 week postoperatively, which will be removed by Dr Safvat in the first follow-up visit. There may be bruising around the eyes and the nose for about a week. Swelling may take 4-6 weeks to settle. The nose usually takes around 12 months, before it settles into its final shape. Before the operation, Dr Safvat will give you detailed instructions on how to care for your nose after Hospital discharge. Rhinoplasty has an Item number that means patients can get a rebate from Medicare and their health fund. The hospital costs are covered by private health funds depending on the patients’ level and type of cover. At your first consultation Dr Safvat and his Team will discuss all the costs associated with the Surgery. Any surgical procedure can be associated with some general complications such as risks associated with general anaesthetics, bleeding and mild to severe infection. Having your procedure done in an accredited hospital minimises these risks. Dr Safvat also prescribes antibiotics upon discharge to minimise infection risk. He will also go through all risks associated with Rhinoplasty at the initial consultation.